A Super Mario Maker streamer working for over twenty days in game to design and complete an “impossible” level has finally defeated his own creation. Failstream uploaded his level last night after over 400 hours of recorded playtime. Super Mario Maker requires level creators to beat their levels before uploading them to the rest of the community. Failstream is a Super Mario Maker streamer who has spent more than a year designing a level so difficult that he wasn’t able to finish it. “Fail’s Flotilla: Final Flight” is an exhausting test of platforming and endurance. It requires players to juggle objects like bombs and Koopa shells in order to leap over or blow up obstacles. It also tasks them to fly through the stage using a cape, avoiding Fire Flower powerups and enemies that can remove their ability to fly. It took Failstream a total of 481 hours worth of practice and attempts before he completed the level. 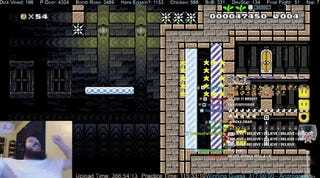 Failstream initially chatted with viewers through his attempt, casually discussing new strategies and level design ideas. Halfway through the level, the attempt turned serious as he began to clear obstacle after obstacle. When he reached the goal, Failstream reacts with a mixture of pure joy and tears. Failstream promptly uploaded the level. The course ID is 154E-0000-0358-C2FB. If you think you’ve got what it takes to clear the course and have half a month of free time to spend, give it a try. Failstream also told Kotaku that he plans to take a nap.